Through news posts and videos, a range of seasonal topics will be explored each month starting with our first entry on ‘Mental Wellbeing’ – to tie in with World Mental Health Day on Tuesday 10th October – brought to us by Sophie Hardy and her pet guinea pig, Chutney. Whatever type of pet you own, it’s critical that you look after their mental wellbeing as well as their physical health. Owners can help ensure their pets’ mental health stays in tip-top condition by, for example, ensuring they are living in the right environment, have appropriate companionship and get enough physical exercise and mental stimulation. What’s right for your pet depends on their type, breed and age – your vet or pet care specialist will be happy to advise! How do you keep Chutney mentally stimulated? Chutney loves to watch what is going on around her, she is inquisitive and nosy! She has a roomy indoor cage for night time and during the day, weather permitting, she plays in her outdoor run. This is situated in the garden where she can graze throughout the day on grass and hay. Her outdoor run consists of cardboard boxes, tubes to run through and a plant pot to hide treats in. She also has a plastic hideaway in case she gets scared. I try to be inventive when providing enrichment, so I change the layout of the pen frequently in order to keep Chutney and her friend Pickle interested and alert. What are Chutney's favourite games? Chutney loves her guinea pig friend, Pickle. The pair can be seen chasing one another around the pen, pop-corning until their hearts are content. She also enjoys foraging for food; I hide blueberries in a plant pot as a special treat and let the pair of them forage away. Fresh vegetables hidden in a paper bag also provide good mental stimulation. How important do you think it is to look after Chutney's mental health and wellbeing? I think it is extremely important to provide small animals with environmental enrichment to keep them mentally stimulated. This allows guinea pigs to display natural behaviours. I try to reflect an environment that is similar to that of wild guinea pigs. This includes living in pairs or groups, foraging for food, getting enough exercise outside in a roomy pen where they can explore and simulate a range of natural behaviours. What advice would you give other pet owners to keep their pet happy and stimulated? Guinea pigs like natural enrichment rather than man-made plastic toys. 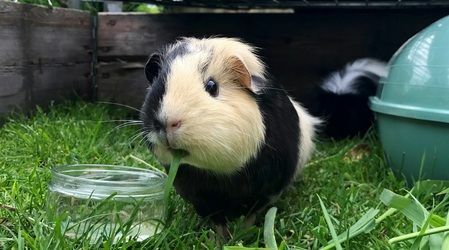 Due to guinea pigs needing to gnaw in order to wear down their continually growing teeth, a branch from a pesticide free fruit tree, willow or poplar can be provided as an excellent, natural dental chew. I regularly add new enrichments and alternate between them as toys only remain attractive for a limited amount of time. Swapping and re-introducing at a later date helps guinea pigs stay interested and inquisitive. I also refrain from adding too many toys all at once. Other enrichment items I provide are toilet or paper towel rolls, Timothy Hay inside a cardboard box and towels or fleece blankets with pouches in so they can hide. Being prey animals, guinea pigs easily get scared so the more hiding places the better. Sophie has given us some great tips on mentally stimulating her guinea pig, Chutney, and for more advice and information on keeping pets of all types mentally stimulated, happy and healthy, take a look at this article. The next instalment in our series will take a look at the importance of annual check-ups and veterinary consultations so keep your eyes peeled in early November! The ‘What does pet health look like?’ series will include a range of relevant topics throughout the year such as cold-weather pet care; ticks, fleas, worms and skin conditions; responsible feeding, diet and exercise; grooming and dental care; travel healthcare; and the importance of companionship.